The Rambler Six and the Rambler V8 are intermediate sized automobiles that were built and marketed by American Motors Corporation (AMC) from 1956 to 1960. Launched on 15 December 1955, the 1956 model year Rambler Six ushered a "new era in motoring has begun" according to George W. Romney, President of AMC. 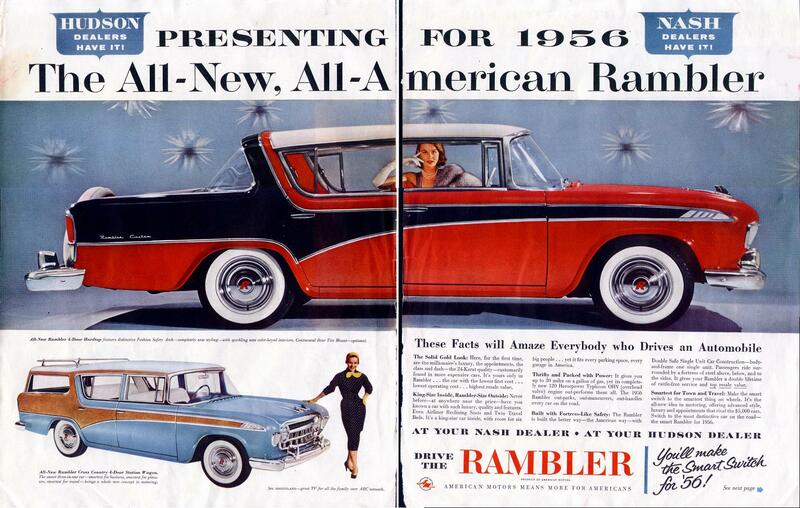 In 1956, the Rambler was sold through both Nash and Hudson networks of dealerships. This resulted from the merger of the two companies to form AMC in 1954. The new Rambler line created and defined a new market segment, the "compact car" as the automobile classification was called at that time. A V8 engine powered model, the Rambler V8, was added in 1957. The new for 1956 Rambler was arguably "the most important car American Motors ever built" in that it not only created and defined a new market segment, emphasized the virtues of compact design, but also enabled the automaker to prosper in the post-World War II marketplace that shifted from a seller's to a buyer's market. The sales war between Ford and Chevrolet conducted during 1953 and 1954 had left little business for the much smaller "independent" automakers trying to compete against the standard models offered by the domestic Big Three (General Motors, Ford, and Chrysler). Imported vehicles from Europe (Volkswagen in 1955, Peugeot in 1958) and Asia (Toyota in 1957) were much smaller, but found buyers in North America. American Motors focused its resources to introduce a line of smaller cars than were then available from the domestic Big Three for the 1957 model year. The designs were developed by its Styling Director, Edmund E. Anderson and they were aimed at a new market segment. Although conventional business thinking states that bigger profits were made from sales of bigger cars, American Motors lacked the resources to develop a full range of models targeting different market segments. As the chairman and president of AMC, George W. Romney also avoided a head-to-head battle with the U.S. automakers by focusing the company on the compact car. He "felt that with the Rambler I had the car of the future" and Romney "bet the farm on the Rambler" by spending US$5.4 million on a "crash program to bring the 1957 Rambler to market a year earlier." The four-door Ramblers for the 1956 model year were completely redesigned, with a characteristic swept-back C-pillars (the Fashion Safety Arch), unusual wing windows on the rear doors, inboard, grille-mounted headlamps, as well as "the widest windshield" of any car. The short-wheelbase two-door (Nash Rambler) versions were no longer available. The new line retained the 108-inch (2,743 mm) wheelbase that was used for the previous four-door versions of the Nash Rambler, but the overall length was increased by 5 inches (127 mm), to 191.14 in (4,855 mm). The Rambler was substantially smaller outside compared to the other popular domestic cars of the era, but its interior room was equal to the top-selling "low-priced" field. Construction was also unusual, being unit body (what Nash called Double Safe Single Unit). The 1956 Rambler models were marketed under both the Nash and Hudson brand names. The cars were almost identical except for minor badge engineering that included different logos on the hubcaps, grille insert, and hood emblem. The new Ramblers came only as four-door models. Along with the usual four-door sedan and station wagon was a new four-door hardtop sedan. Rambler also introduced the industry's first four-door hardtop station wagon in 1956. The station wagons used the same rear doors as the sedans with the back roof dipped lower over the cargo area and featured a standard roof rack. The wagon models were called Cross Country. An innovation for station wagons was Rambler's roll-down tailgate window; competitors' models used upward-hinged windows. The new car was described as "distinct and different .... can be recognized at any angle from its wide-open competition- type grille to the pronounced arch over rear window." According to automobile journalist Floyd Clymer, "economy and high-performance do not go hand in hand, but in the Rambler, the owner will find a happy medium ... though smaller, is safer than many cars. The welded, unitized body-frame construction offers above-average protection in collisions." The single-unit construction that was used by AMC on all of its models provided a marketing advantage by offering buyers a $25,000 personal automobile injury insurance policy at no extra cost. The Typhoon straight-six for the new Rambler was based on the previous 195.6 cu in (3.2 L) block, but was improved and featured overhead valves and produced 120 bhp (89 kW; 122 PS). It was the only engine available in the 1956 Rambler because the automaker was still developing its own V8. This engine was said to deliver 33% more power than the 1955 version, and - at up to 30 miles per US gallon (7.8 L/100 km; 36 mpg‑imp) - provided better fuel economy than the competition. The new Rambler also changed to a 12-volt electrical system. The automatic transmission was the GM-produced Hydramatic (called Flashaway by AMC). A torque tube drive system was used with a four-wheel coil spring suspension instead of the previous Hotchkiss drive setup. The interiors were offered in fifteen colors, and offered "genuine leather" (in six colors) as an option. The station wagons were popular with buyers, and in addition to power brakes (standard on Custom models), frequently ordered options included power steering, two- and three-tone exterior color schemes, a continental tire, Weather Eye heating and air conditioning system, as well as dealer accessory window insect screens to use with the individually adjustable and reclining front seats that could be used as a bed. The new Rambler model became the replacement for the large-sized Nash and Hudson "legacy" models that were now suffering from dwindling sales. On the other hand, the Rambler was the only completely new "popular-priced" car in 1956. Consumer reaction to the 1956 Rambler was very positive. Advertising for the new car urged potential buyers to "Drive the Rambler - You'll Make the Smart Switch for 1956." Almost 74 percent of surveyed Rambler owners by Popular Mechanics described their cars as small and roomy, as well as easy to park and operate. Sales for the inaugural year totaled 66,573. Of these, 20,496 were badged as Hudsons. Soon, the all-new "compact-sized" (as vehicles were defined at that time) models experienced a "sales explosion". In 1957, the Rambler was established as a separate marque and these models became the foundation for the new company's best sales performance through the late 1950s. Sales increased to 82,000. The four-door sedans and station wagons were offered as well as a four-door hardtop body style with no "B" pillar. The most basic trim level, Deluxe, was essentially for fleet customers and only available with the I6 engine. The Super and Custom trimmed models came with the I6 or AMC's new V8 engine. The Deluxe had no exterior side trim or series name, the Super came with a single full-length body side molding and a "Super" script emblem, and the Custom featured dual full body side moldings with a "Custom" script emblem and a round "R" medallion on the top of the front fenders. The new Rambler Cross Country was "typical of the stylish, yet highly practical wagons built by AMC in the 1950s" and was offered in solid colors or two- or three-tone paint schemes. Only a few station wagons "were available in 1957 with the very vogue hardtop configuration", and Rambler's Cross Country station wagon in Custom trim carried a relatively low price of $2,715. Options included seat belts, padded dash, and child proof door locks. This was the first year the Rambler offered a new 250 cu in (4.1 L) V8 engine, producing 190 bhp (142 kW; 193 PS). A companion model in four-door hardtop style and featuring AMC's new high-performance 327 cu in (5.4 L) V8 was also introduced in 1957. This was the Rambler Rebel and it was an early "muscle car." With overdrive, the 1957 model was capable of up to 32 mpg‑US (38 mpg‑imp; 7.4 L/100 km). The first American journalist to drive a U.S. automobile uncensored through the Soviet Union was Harry Walton in a brand new 1957 Rambler station wagon assembled in Belgium. The engine was detuned at the Brussels assembly plant to run on 74 octane gasoline available only in certain gas stations, and on one occasion, "to the Rambler's eternal credit it swallowed the [ordinary Soviet] stuff, protesting mildly." The heavily loaded wagon cruised at 60 mph (97 km/h) and travelled 22.35 miles per US gallon (10.52 L/100 km; 26.84 mpg‑imp). The journalist drove 3,500 miles (5,633 km) from the Polish border near Brest to the port city of Yalta, and reported the Rambler station wagon "galvanized Russians into attention everywhere." George W. Romney stated "the Hudson and Nash would remain distinctive in size from the Rambler in 1958." Designs were developed for the big-car Hudson and Nash models to share the Rambler automobile platform by stretching the body about nine inches ahead of the cowl. However, the Rambler become the new AMC division following the discontinuation of both the Nash and Hudson lines after the 1957 model year. The larger-sized 1958 Ramblers incorporated "more than 100 changes and were outwardly quite different from their predecessors." The cars received "a complete reskin that made the 1956 bodies look a bit bulkier". This major redesign featured new front and rear fenders. A new front end moved the headlamps from inside the grille to the top of the front fenders and featured twin headlamps on each side on the "Super" and "Custom" models, as well as full-length bodyside moldings. The basic "Deluxe" trim models had no side trim and came standard with single headlights, but the new "quad" headlights were optional. The 1958 Ramblers now had the industry's requisite flared tailfins. The Rambler line was one of the last among the domestic automobiles to incorporate tailfins to its body design (and also one of the first to eliminate them). When asked why the 1958 Ramblers featured this styling feature, AMC's Chairman and CEO George W. Romney responded, "If we have to use tail fins to get people to try compact cars, we'll use tail fins. Later on we will certainly be able to do away with them, and to build clean, simple, uncluttered cars." The Rambler models continued to be the shortest cars in the U.S. – at 191 inches (4,851 mm) in total length – with room for six-passengers. Rambler's marketing focused on having "the best of both: 1. American big car room and comfort. 2. European small car economy and handling ease." Powering the Rambler Six was AMC's new 127 hp (95 kW; 129 PS) overhead valve (OHV) 195.6 cu in (3.2 L) straight-six. NASCAR tests showed the Rambler Six had a $0.01 per mile gasoline cost when equipped with overdrive transmission. A V8 engine was available in the Rambler Rebel models. A Borg-Warner torque converter "Flash-O-Matic" automatic transmission, with the "then-trendy pushbutton" gear selection on the far left side of the instrument panel, was optional. Also new on the left side for the driver was a step-on parking brake pedal. American Motors instituted a new paint system for the 1958 model year. All Ramblers received rust-inhibiting by submerging assembled bodies up to their roof into a large 40-foot (12 m) vat of primer (not sprayed on) before the color coat was applied, a revolutionary process that was later copied by other automakers. After drying, an additional wax-based compound was sprayed inside girders, rocker panels, fenders, and other hidden areas in the car bodies. American Motors promoted the 1958 Rambler in several advertising campaigns. One approach featured George W. Romney challenging "the big car concept." A series of print ads also mocked the domestic Big Three automakers' standard-sized cars featuring illustrations by famous cartoonists showing the compact Rambler easily getting through places that would get the large "gas guzzling dinosaur" automobiles stuck. An example is the story, "The Millionaire and The Rambler" by Otto Soglow. Chon Day illustrated a story on how "Rambler foils bank robbery." Sales of the Rambler six and V8 increased to 119,000 during a year when all U.S. cars were down in volume. The 1958 Ramblers "sold like hotcakes" and returned the smallest U.S. automaker to profitability. Together with the smaller Rambler American line, AMC "broke sales records" in 1958 as consumers valued basic transportation from their automobiles and no longer cared "how big their cars were." 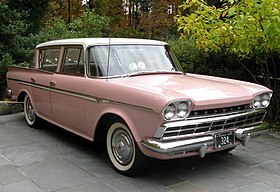 Although in the midst of the Recession of 1958, Rambler captured seventh place in automobile sales. Improvements to the Rambler included a full-width die-cast grille while the body side gained an uninterrupted line. Rather than blending into the C-pillar, the belt line continued to the tailfins. Engineering changes included thicker brake linings and larger brakes for V8-powered cars, as well as fuel economy improvements with lower axle ratios and more efficient carburetor for the I6 engines. An electrically engaged overdrive unit behind the three-speed manual transmission was also available. The automatic transmission was operated by pushbuttons on the left-side of the instrument panel. To increase longevity, Rambler mufflers were aluminum-coated on the inside and zinc-coated on the outside. On cars with automatic transmission, engine starting was now incorporated into the neutral pushbutton, thus eliminating the ignition key start switch. Accidental starter engagement was prevented by a lockout when the engine was running. A total of eleven models were offered for 1959, all four-door versions of sedans, station wagons, and "Country Club" hardtop (no B-pillar) body styles. Premium options and conveniences continued to be offered including "Weather Eye" air-conditioning, air suspension on V8s, limited slip differentials, an exterior mounted continental tire, as well as the American Motors' exclusive individually adjustable and reclining front seats with headrests. Sales of the bigger Ramblers did very well, especially given the automobile industry's modest recovery in 1959. Ramblers attracted over a quarter-million customers, with the majority of them were sixes, as the Rebel V8 found just 16,399 buyers. Rambler finished 1959 in sixth place among all models produced in the U.S. and AMC ended with $60 million in profits. The 1960 models featured numerous exterior and interior design changes. The greenhouse was made "lighter" with a narrower C-pillar and roof profile, as well as slanting both the windshield and rear window at a greater angle providing for an "airy cabin." The front end was simplified, while the tailfins became smaller thus highlighting the new tall taillamps. The overall length was trimmed by 1.6 inches (41 mm) because of a new spit-bumper design. Riding on 15-inch wheels the Rambler appeared to be larger than it actually was. The interior was also revised and the instrument panel now incorporated all instrumentation within a large oval in front of the driver. The practice of separate Six and Rebel V8 models now ended with the focus on the Rambler name and the trim three levels: "Deluxe", "Super", and "Custom". Each was offered with "Economy 6 or Rebel V-8 engines." The larger Rambler sedans were joined by a new four-door Rambler American model that rode on the shorter 100 in (2,540 mm) platform as the smaller two-door sedan and wagon series, but sales of all Ramblers continued to increase. In 1960, the Rambler line reached third place in total annual industry sales in the United States. The 1960 Rambler Six with its 127 hp (95 kW; 129 PS) 195.6 cu in (3.2 L) engine became the best selling model for AMC with 297,368 sold for the year. Former Hudson Motor Car Company plant on Danforth Avenue in Toronto produced the Rambler Six in 1957 before it ceased production as subsequent models were imported into Canada. American Motors established agreement with French automaker Renault to assemble Ramblers from CKD (Completely Knocked Down) kits in the Vilvoorde Renault Factory in Haren, Belgium. The cars were sold and serviced through Renault dealers in Algeria, Austria, Belgium, France, the Netherlands, and Luxembourg. The Rambler was sold as an "executive car" in these markets. Midsize Rambler models were assembled from CKD kits in Mexico during two different periods. The first was under Armadora Mexicana that based in Mexico City, between 1956 and 1957, and the second under Planta REO that based in Monterrey, between 1958 and 1959. Because of the low sales volume, American Motors terminated its contract with Armadora Mexicana that originally began with AMC's predecessor company in 1950. Complete Rambler models were again imported from the United States (between 1957 and 1958), sold through a limited network of dealerships of which most were located in Mexico City, until the agreement with Planta REO was formalized. Between 1958 and 1959, the Mexican midsize Rambler line consisted of a four-door sedan in Super trim, a four-door hardtop in Super trim and a four-door pillared wagon in Cross Country trim. All three versions were powered by the one-barrel OHV 127 gross hp 195.6 cubic inches inline six cylinder engines. Three-speed manual transmission was the standard issue with the three-speed automatic as an option, including the push-button version. The problem of low sales volume continued under Planta REO and AMC also cancelled this contract. The company would eventually sign an agreement with Toyota, which would cause speculations of Planta REO neglecting the Rambler brand in favor of the Japanese one, being allegedly an important or the main cause of the low commercial success of this second venture of AMC in Mexico. Imports of completed AMC vehicles into Mexico resumed until a third domestic production partner was established. Willys Mexicana, the company what would become Vehículos Automotores Mexicanos (VAM) was the third local company that AMC would sign an agreement in 1960. However, VAM did not assemble the Rambler Six and Rambler V8 models, focusing instead on the smaller-sized Rambler American cars. This marked the end of both the midsize Ramblers and subsequent first-generation Rambler Classics in the Mexican market. VAM never sought to import them instead either in 1960 and 1961 and the auto industry integration decree published in 1962 would legally ban the importation of fully assembled vehicles and engines. Willys Mexicana would not introduce a midsize AMC automobile until 1963, the model in question being the now second-generation Rambler Classic models. The 1956-1959 Rambler models represented the only case of an AMC midsize station wagon being available in Mexico as the future second-generation Classic, Rebel and Matador units would not be produced in the country. It also represented the only case in Mexico in which AMC's intermediate line had more than two body styles available. As of 2017, there is not record of the performance 1957 Rambler Rebel model being available in Mexico, although there was the possibility of it being imported through individual orders. Ramblers were assembled in Australia by Australian Motor Industries (AMI) starting in October 1960 under an agreement with AMC. They were assembled with right-hand drive from Partial Knock Down (PKD) kits shipped from U.S. factories. Many components such as upholstery, lights, and other parts were locally sourced to meet import tariff concessions. Before this agreement was reached, complete right-hand drive Ramblers were imported under the Nash marque. AMI would go on to build AMC vehicles until 1976. Nash and Hudson vehicles were imported into New Zealand in the late-1920s and 1930s. From 1935 until 1954 Nash, Hudson, Studebaker and Standard vehicles were assembled by Motor Assemblies (South Island) Limited in Christchurch. The plant was acquired by Standard-Triumph International in 1954 and Rambler production went to VW Motors in Otahuhu, Auckland where they were made alongside Volkswagen vehicles until 1962. In 1963 a new assembly plant was built in Thames by Campbell Motors Industries (CMI) specifically to manufacture AMC vehicles and production began in 1964 starting with the Rambler Classic. The cars were manufactured from Partial Knock Down kits sourced from Canada. CMI would continue to build AMC vehicles until 1971. American Motors began the process of differentiating the Rambler brand name from its various sizes and similar model names. New nameplates were introduced; the Rambler Six and Rambler Rebel V8 were both renamed the Rambler Classic in 1961. ^ Romney, George (28 November 1955). "A new era in motoring has begun". Life. 39 (22): 4. Retrieved 18 April 2015. ^ "See the all new Rambler "Cross Country" - Nash dealers have it, Hudson dealers have it". Life. 40 (7): 105. 13 February 1956. Retrieved 18 April 2015. ^ a b c d Auto Editors of Consumer Guide (5 September 2007). "1956-1957 Rambler". auto.howstuffworks.com. Retrieved 18 April 2015. ^ Flammang, James M. (1994). Chronicle of the American automobile: over 100 years of auto history. Publications International. p. 278. ISBN 978-0-7853-0778-5. Retrieved 18 April 2015. ^ a b c d e f g "Make the smart switch for '56 (Rambler advertisement)". Oldcarbrochures.com. Retrieved 18 April 2015. ^ a b c d "All-new Rambler for 1956". Life. 40 (10): 75. 5 March 1956. Retrieved 18 April 2015. ^ a b c "Rambler has everything new - even a hardtop wagon". Popular Mechanics. 105 (1): 114–117. January 1956. Retrieved 18 April 2015. ^ a b c Rowsome Jr., Frank (January 1956). "Rambler puts a new engine in a new body". Popular Science. 168 (1): 148–151. Retrieved 18 April 2015. ^ a b Olsen, Byron (2000). Station Wagons. Motorbooks. pp. 55–56. ISBN 978-0-7603-0632-1. Retrieved 18 April 2015. ^ "Parade of '56 cars: Rambler". Popular Mechanics. 105 (2): 184. February 1956. Retrieved 18 April 2015. ^ Clymer, Floyd (June 1956). "Clymer road tests the 1956 Rambler". Popular Mechanics. 105 (6): 107–234. Retrieved 18 April 2015. ^ "We back the biggest difference in cars today with a $25,000 personal automobile injury insurance policy". Life. 40 (11): 16–17. 12 March 1956. Retrieved 18 April 2015. ^ "Presenting for 1956 (advertisement)". Old Car Advertising. Retrieved 18 April 2015. ^ a b "Rambler is small but roomy and easy to park, say owners". Popular Mechanics. 105 (6): 106–107, 109–111, 224, 226, 228, 230, 232, 234. June 1956. Retrieved 18 April 2015. ^ a b Auto Editors of Consumer Guide (5 September 2007). "Reaction to the 1956 Rambler". auto.howstuffworks.com. Retrieved 18 April 2015. ^ a b c d Auto Editors of Consumer Guide (5 September 2007). "1956-1957 Rambler Specifications". auto.howstuffworks.com. Retrieved 18 April 2015. ^ a b Gunnell, John (2004). Standard guide to 1950s American cars. Krause Publications. p. 171. ISBN 978-0-87349-868-5. Retrieved 18 April 2015. ^ Mort, Norm (2010). American Station Wagons: The Golden Era 1950-1975. Veloce. p. 19. ISBN 9781845842680. Retrieved 18 April 2015. ^ Bogart, Angelo Van (2010). 50s Flashback: Fabulous Cars We'll Never Forget. Krause Publications. p. 103. ISBN 9781440214127. Retrieved 18 April 2015. 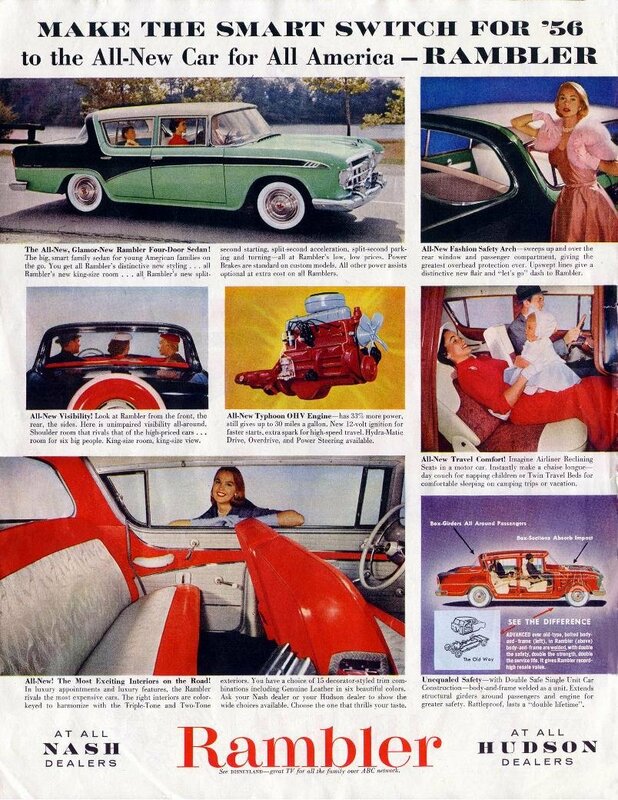 ^ "1957 Rambler Brochure". Oldcarbrochures.com. p. 8. Retrieved 18 April 2015. ^ Holder, William; Kunz, Phil (2006). Extreme Muscle Cars: The Factory Lightweight Legacy. Krause Publications. p. 16. ISBN 978-0-89689-278-1. ^ "Only '57 Rambler gives you both (advertisement)". Oldcarbrochures.com. Retrieved 18 April 2015. ^ a b c d Walton, Harry (February 1958). "Inside Russia by car". Popular Science. 172 (2): 90–104, 234. Retrieved 18 April 2015. ^ Railton, Art (February 1957). "Detroit Listening Post". Popular Mechanics. 107 (2): 195. Retrieved 18 April 2015. ^ Railton, Art (May 1957). "Detroit Listening Post". Popular Mechanics. 107 (5): 97. Retrieved 18 April 2015. ^ Mort, Norm (2010). American 'independent' Automakers: AMC to Willys 1945 to 1960. Veloce. p. 62. ISBN 9781845842390. Retrieved 18 April 2015. ^ Consumer Guide (1981). Cars of the 50s. Beekman House. p. 82. ISBN 9780517262788. Retrieved 18 April 2015. ^ a b c Auto Editors of Consumer Guide (15 June 2007). "1958 Rambler Cars". auto.howstuffworks.com. Retrieved 18 April 2015. ^ a b c Gunnell, John (2004). Standard guide to 1950s American cars. Krause Publications. p. 172. ISBN 978-0-87349-868-5. Retrieved 18 April 2015. ^ a b "Rambler". Popular Science. 171 (5): 96. November 1957. Retrieved 18 April 2015. ^ Christensen, Carl R.; Andrews, Kenneth R.; Bower, Joseph L.; Learned, Edmund P. (1978). Business policy. R. D. Irwin. p. 158. ISBN 978-0-256-01989-6. Retrieved 18 April 2015. ^ a b c Lindsay, David R. (January 1958). "'58 Wagons: the word is comfort". Popular Science. 172 (1): 106. Retrieved 18 April 2015. ^ Mort, Norm (2010). American Station Wagons: The Golden Era 1950-1975. Hubble & Hattie. p. 21. ISBN 9781845842680. Retrieved 18 April 2015. ^ a b "All new Rambler (advertisement)". Life. 43 (19): 16. 4 November 1957. Retrieved 18 April 2015. ^ Carroll, William (January 1958). "Getting the most from your 1958 car". Popular Science. 172 (1): 125. Retrieved 18 April 2015. ^ Auto Editors of Consumer Guide (22 August 2007). "1958 Rambler Rebel". auto.howstuffworks.com. Retrieved 18 April 2015. ^ "1958 American Motors (advertisement)". Life: 111. 17 February 1958. Retrieved 18 April 2015. ^ Stevenson, Heon (2008). American automobile advertising, 1930-1980: an illustrated history. McFarland. p. 220. ISBN 978-0-7864-3685-9. Retrieved 18 April 2015. ^ "The Millionaire and The Rambler (advertisement)". Life. 44 (3): inside front cover. 20 January 1958. Retrieved 18 April 2015. ^ "Rambler foils bank robbery (advertisement)". Life. 44 (26): inside front cover. 30 June 1958. Retrieved 18 April 2015. ^ a b Francis, Devon (October 1958). "1959 Rambler Boosts its miles per gallon". Popular Science. 173 (4): 100–101. Retrieved 18 April 2015. ^ Plas, Gerald O. (1967). The Romney riddle. Berwyn Publishers. p. 21. Retrieved 18 April 2015. ^ Covey, Stephen R. (2011). The 3rd Alternative: Solving Life's Most Difficult Problems. Free Press. p. 136. ISBN 978-1-4516-2626-1. Retrieved 18 April 2015. ^ Shiers, Will (2010). Roadside Relics: America's Abandoned Automobiles. Motorbooks. p. 128. ISBN 9781610601146. Retrieved 18 April 2015. ^ a b Auto Editors of Consumer Guide (10 October 2007). "1959 Rambler Six Custom Sedan". HowStuffWorks.com. Retrieved 18 April 2015. ^ a b Shea, Terry (September 2012). "Brand Champions". Hemmings Classic Car: 19. ^ Whipple, Jim (August 1960). "Rambler is comfortable to easy to drive, but marred by minor flaws". Popular Mechanics. 114 (2): 86–90, 228. Retrieved 18 April 2015. ^ Auto Editors of Consumer Guide (22 August 2007). "1960 Rambler Rebel". auto.howstuffworks.com. Retrieved 18 April 2015. ^ Auto Editors of Consumer Guide (6 November 2007). "1958-1960 Rambler American". HowStuffWorks.com. Retrieved 18 April 2015. ^ Catlett, J. Stephen (1999). Martin's and Miller's Greensboro. Arcadia Publishing. p. 122. ISBN 978-0-7385-0315-8. ^ Lind, Tommy. "History of Renault 1898-1975: International agreements..." Tommy Lind's History of Renault 1898-1975. Retrieved 18 April 2015. ^ "Le Cimetiere Des Autos Oubloees: Renault Rambler (1962-67)" (in French). The graveyard of forgotten cars. 4 April 2007. Retrieved 18 April 2015. ^ Lozano, Jose Ramírez (11 June 2011). "Planta REO de México, S. A." (in Spanish). Retro Busses. Retrieved 18 April 2015. ^ McPherson, Scott (26 January 2014). "Automotive History: Ramblin' in the Southern Hemisphere". Curb Side Classic. Retrieved 18 April 2015. ^ "History: NZ Hudson Essex Terraplane Club, incl Nash & Rambler". het.org.nz. Retrieved 18 April 2015. ^ "American Motors". Automobile Quarterly. 40 (4): 102. 2000. Foster, Patrick R. (2004). AMC Cars: 1954-1987, An Illustrated History. Motorbooks International. ISBN 978-1-58388-112-5. Foster, Patrick R. (1993). The Last Independent. Motorbooks International. ISBN 978-0-87341-240-7. Wikimedia Commons has media related to Rambler Six and V8. This page was last edited on 8 April 2019, at 22:56 (UTC).